I'm so excited to be paired up with Hope Newport of Teaching With Hope for an education resource product swap! We'll be swapping products and coming back to post about it in a couple of weeks after we've had a chance to use them in our classrooms. How long have you been teaching? This is my 6th year teaching! What grade levels have you taught? I started out teaching 5th, moved to 3rd, then 1st for a year and I have been teaching 3rd for the last 4 years. What is your favourite part about being a teacher? I love watching kids light up and get genuinely excited about learning. My favorite part of teaching is creating that perfect lesson that fully engages kids and leaves them wanting to learn more. I became a teacher because I love learning. Seeing kids share that same joy with me makes every day worth it! What is your best advice for a beginning teacher? Believe in yourself and don't be afraid to put yourself out there. I am a people pleaser. I don't like to step on anyone's toes. When I began teaching that left me going with the flow instead of being who I truly am. I was unsure and hesitant. It's important to trust your instincts and know that if you feel like what you're doing is best for kids to go for it. 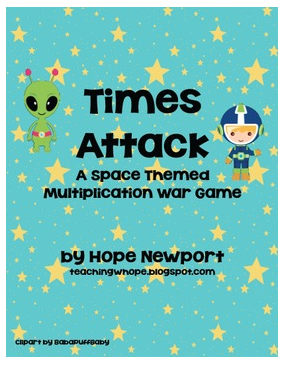 I can't wait to try out Hope's Multiplication Centers and Giganti-Pack with my third graders! Until then, here's a Times Attack freebie from Hope's store. Clicking on the photo will take you to the freebie.